Jane Austen is famous for her romantic works, but within academic circles, she is also known for her social critiques. In her first and last completed novels, Northanger Abbey and Persuasion, Austen presets a dense social critique on courting and romance. The characters that treat marriage as a means to move up in the social ladder are not given a happy ending. Instead, their actions are meant to discourage us from following in their footsteps. Instead, the main characters marry the person whom they fall in love with, having accepted the other person for who they are. Yet, when her novels are adapted to films, these critiques are removed to allow directors to appeal to the modern viewer by expanding on the novels’ everlasting romance. Isabella Thorpe meets Catherine Morland, and is entirely convinced that they must be "best of friends." Northanger Abbey. Directed by Jon Jones. Granada Ventures, 2007. Film. Jane Austen does not neglect inserting a social critique about courtship in one of her first novels, Northanger Abbey. Isabella Thorpe and John Thorpe are infamous throughout the novel for seeking connections in hopes of gaining opportunities for upward mobility. Isabella and John pursue their goal in different manners, but the end result is the same. On countless occasions, Isabella proves to be frivolous, caring more about what a potential husband can offer her, rather than attempting to fall in love. When out with the main character, Catherine Morland, Isabella notices “two odious young men who have been staring at me this half hour” (Northanger Abbey 27). Isabella pretends to be annoyed by their behavior, while actively chasing after them in the streets with Catherine. Soon after, her frivolous behavior reappears when Isabella and Catherine run into John Thorpe and James Morland, Catherine’s brother. James appears transfixed by Isabella, who gladly accepts his advances, completely forgetting the men she and Catherine were chasing just before. Part of her reason for befriending Catherine could be because she wanted to marry James, who she thought was rich. When Isabella finds out that James is only to be given four hundred pounds a year, she is greatly disappointed. For this reason, she finds it easier to forget James and their engagement when she meets Frederick Tilney, who would be a more advantageous marriage partner. When Catherine asks Henry Tilney, her love interest, about Isabella’s behavior, his response is, “a woman in love with one man cannot flirt with another” (Northanger Abbey 103). Therefore, since a woman who is truly in love with another would never flirt with anyone but them, it is obvious that Isabella bears no real feelings toward James. The engagement is later broken and James fears that Isabella and Frederick Tilney will engage. However, Frederick grows weary of the game he was playing with Isabella, and dismisses her. Jane Austen presents the cold betrayal of James as a sympathetic event—James is distraught and Catherine worries for him (Northanger Abbey 139). On the other hand, Isabella’s actions cost her her relationships with Catherine, James, and Frederick. John Thorpe’s character adds another level of complexity to Austen’s criticism of courting someone for selfish reasons. John is a narcissist who loves to hyperbolize his own achievements and possessions. At first, Catherine finds him pleasant and declares, “I like him very much; he seems very agreeable” (Northanger Abbey 32). Believing her family to be rich and that she is to inherit the Allens' wealth after they pass, John intends to woo her. In order to achieve this, he makes use of lies, such as claiming that he saw Mr. and Mrs. Tilney driving up Lansdown Road (Northanger Abbey 57). Convinced that the Tilneys may have cancelled their plans with Catherine, she agrees to go with them, only to see them walking toward her apartment, confused to see her riding with John Thorpe (Northanger Abbey 58). Instead of stopping to allow her to get off, John continues on. John Thorpe forces Catherine Morland to join him on a ride to Blaize Castle. After this moment, Catherine finds herself “less and less disposed either to be agreeable herself, or to find her companion so” (Northanger Abbey 60). Not only does John prove to be proud, he is also unable to consider the other person’s feelings, even if he claims to be in love with them. Later, when he makes his intentions clear to Isabella and Catherine rejects him, his pride is greatly wounded. When he meets General Tilney, he tells him that the Morlands are not rich as he initially said, but that they are “a necessitous family” (Northanger Abbey 170). Such behavior is frowned upon, especially since it is not true. Just like with Isabella, Austen demonstrates how unacceptable it is to seek a marriage partner for their social status, rather than their person. 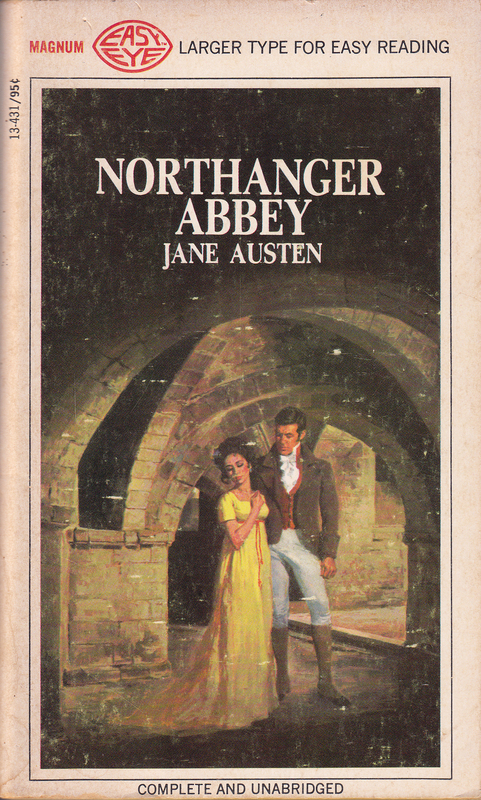 A very steamy portrayal of Northanger Abbey, featuring Catherine Morland and Henry Tilney. Austen, Jane. "Northanger Abbey: Complete and Unabridged." Magnum Easy Eye, 1968. Austen considers the ideal couple to be one where both parties love the other for who they are, rather than what they can offer them. Neither Isabella nor John truly love any of the people that they want to marry. 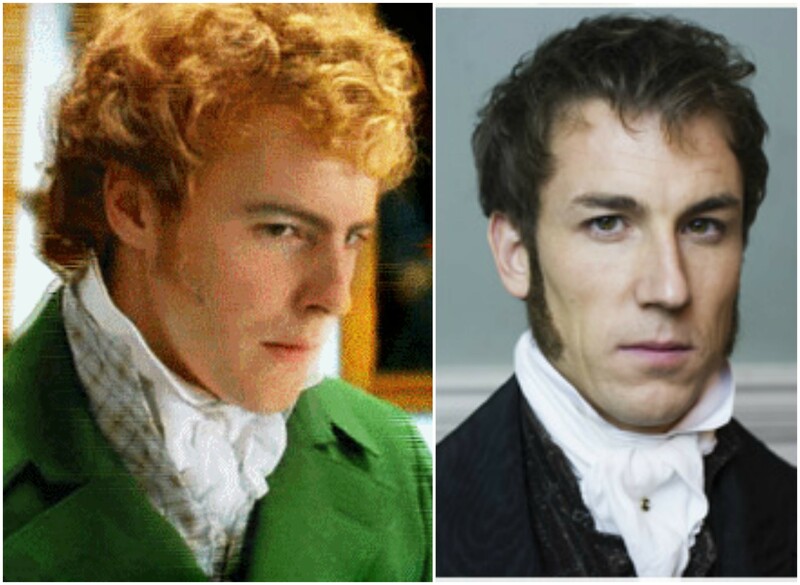 However, the hero and heroine of Northanger Abbey are the very opposite of the Thorpe siblings. In Northanger Abbey, Jane Austen parodies the gothic novel genre by creating a heroine that is very unconventional. Catherine Morland’s “situation in life, the character of her father and mother, her own person and disposition, were all equally against her” (Northanger Abbey 5). Despite this, Henry Tilney accepts her at the end of the novel. Instead of seeking her for her family’s money and connections, as Isabella and John Thorpe do, he slowly comes to know and love her. The two start their relationship with little flirtations, during which time it is known that he is very smart, resourceful, and charming. Over a picnic, Catherine learns that he is well-educated in the arts and that he enjoys reading novels. Through these intimate moments, and more, Catherine and Henry come to know each other on a deeper level, and he comes to accept her transgressions. When she is invited to his house, he entertains her fantasies about his family’s gothic mansion. The cover on the left might not be an accurate portrayal of the book's contents, but it is a great depiction of what Catherine might have anticipated her visit to Northanger Abbey would be: full of horror and seduction. Even after she recognizes that he was only teasing her, she finds herself pursuing the crazy idea that General Tilney keeps his wife locked up in the house. Despite this, Henry is still able to profess his love for Catherine, thus proving that he has accepted her as his wife even with all her transgressions as a naive and gullible girl. 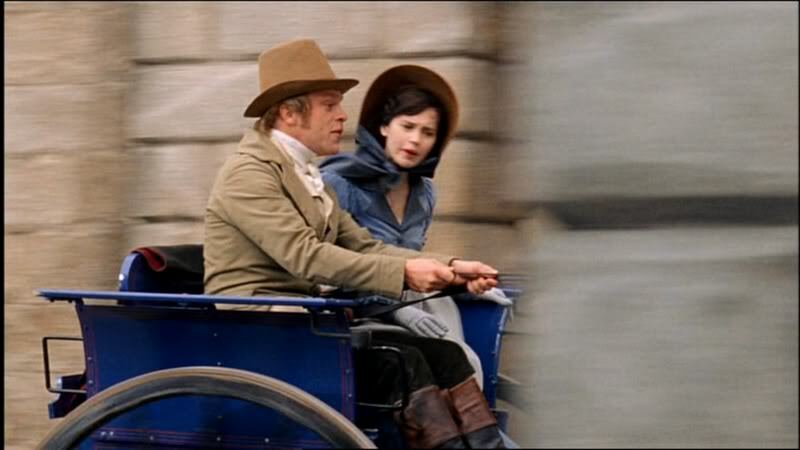 In Persuasion, Austen introduces Mr. William Elliot, a cousin of the main character’s family, Anne Elliot. When first introduced, Anne finds him to be a very agreeable man, until the two discuss what they consider to be good company. Whereas Anne has high standards that include “clever, well-informed people,” Mr. Elliot believes that “good company requires only birth, education and manners, and with regard to education is not very nice” (Persuasion 106). Not long after, it is revealed that Mr. Elliot had alternative plans for rekindling his connections with the Elliots, after having rejected them when he was young. After the death of his wife, whom he married for her family’s money, and “having long had as much money as he could spend, nothing to wish for on the side of avarice or indulgence, he has been gradually learning to pin his happiness upon the consequence he is heir to” (Persuasion 145). Therefore, his kind actions toward Anne are meant to woo her to marry him, yet he never outwardly declares his intention to marry her so that he may back out of the obligation if need be. This is perfectly illustrated when he proposes to Anne: “The name of Anne Elliot has long had an interesting sound to me. very long has it possessed a charm over my fancy; and, if I dared, I would breathe my wishes that the name might never change” (132). When it turns out that he cannot marry Anne for she is engaged to Captain Wentworth, he decides to go after Mrs. Clay, hoping to still inherit the baronetcy. His self-indulging actions, which drove him to seek out connections for their monetary value, is why Austen shamefully forces him out of Bath at the end of the novel. Mr. Elliot from the 2007 and 1995 film adaptations, looking very suspicious. Persuasion. Directed by Adrian Shergold. Clerkenwell Films, 2007. Film. Persuasion. Directed by Roger Michell. Sony Pictures Classics, 1995. Film. In the 2007 adaptation of Persuasion, Captain Wentworth wistfully watches Anne Elliot play the piano. When she turns to look, he has mysteriously disappeared. Austen further develops her idea of what an ideal love looks like in her final novel, Persuasion. Whereas in Northanger Abbey, the focus was mainly on critiques of courting and encouraging a true love, in Persuasion Austen states that a happy marriage is only possible when both parties love each other for who they are. When Anne and Captain Wentworth first meet, they are absolutely in love with each other, but they cannot marry because Captain Wentworth would not be able to offer Anne a safe and stable life. For that reason, the two part ways—each still holding onto a bit of their love for the other. However, Captain Wentworth was hurt by this rejection and decided to forget her and seek a “firm” woman instead (Persuasion 63). They are not able to rekindle their love until Anne and Captain Wentworth accept parts of themselves and each other that they do not like. For Anne, this is the decision of rejecting Captain Wentworth and forfeiting a happy romance with him when she was young. On the other hand, Captain Wentworth must accept and recognize Anne’s decision, as well as change his opinion of her and women. After the heartbreak she put him through, Captain Wentworth sought a woman with a strong character. He was unable to realize that Anne, who he thought was feeble of mind, was actually strong-minded until the incident at Lyme. As Wentworth declares, “I did not understand you. I shut my eyes, and would not understand you, or do you justice” (Persuasion 175). After the Lyme incident, he recognizes just how reliable she is, and begins to consider that she did not reject him without thought those seven years ago. They are finally able to marry because they both love and accept the other person for who they are. Film adaptations of Jane Austen’s books are cut of their social critique, the main reason being that modern audiences are attracted to the romance of her novels. Through the revival of Austen’s romance, her work manages to live on in our society. The romance in these film adaptations accentuate the elements that modern audiences respond to, such as female independence and a partner who loves unconditionally. Northanger Abbey. Directed by Jon Jones. Granada Ventures, 2007. Film. The Lake House. Directed by Alejandro Agresti. Warner Bros. Pictures, 2006. Film. Persuasion. Directed by Adrian Shergold. Clerkenwell Films, 2007. Film. Persuasion. Directed by Roger Michell. Sony Pictures Classics, 1995. Film. Northanger Abbey proves to have a romance that appeals to the modern audience, as the portrayal of the love between Catherine Morland and Henry Tilney in the 2007 film adaptation is very true to the book. The character of Henry Tilney is sweet and amusing, and Catherine Morland is quite her naive self. The movie presents the two as a very innocent, endearing couple, which modern audiences enjoy for it definitely means that they will remain in love forever. The film successfully works with this aspect of Austen’s novel, fully knowing that such a romance will definitely attract the modern audience. Due to this fact, the director spends more time developing the romance between Henry and Catherine, rather than focusing on other conversations with Mr. or Mrs. Allen. One of the many scenes added in the movie occurs when Catherine is at Northanger Abbey and the General leaves on business. Henry and Catherine go riding to Woodstone on horseback, where they get caught in the rain and end up racing each other back to Northanger. This scene is a perfect bonding moment, where both characters discover the adventurous nature in the other, which they fall in love with. The director also uses the romance in Northanger Abbey to improve upon the rest of the plot. The audience fears for the worst after Henry discovers what terrible fantasies Catherine was forming about his father. Up until that point, there has been no reason for the audience to suspect any problems to brew between the two. Hope is restored the moment Henry arrives to her house on a white horse—he looks at her with urgency and adoration in his eye. With all these additions to the romance of the novel, it is no wonder the director did not include much social critique, as if the romance pushed it out of the way. From 2:06 - 4:00 minutes, Henry and Catherine share a precious moment on horseback. Austen, Jane. Northanger Abbey. Edited by Susan Fraiman, Norton Critical Edition, 2004. The film adaptations of Persuasion present a modernized version of the romance between Anne Elliot and Captain Wentworth, choosing to capitalize on their relationship rather than the dense social critique in Austen’s original novel. 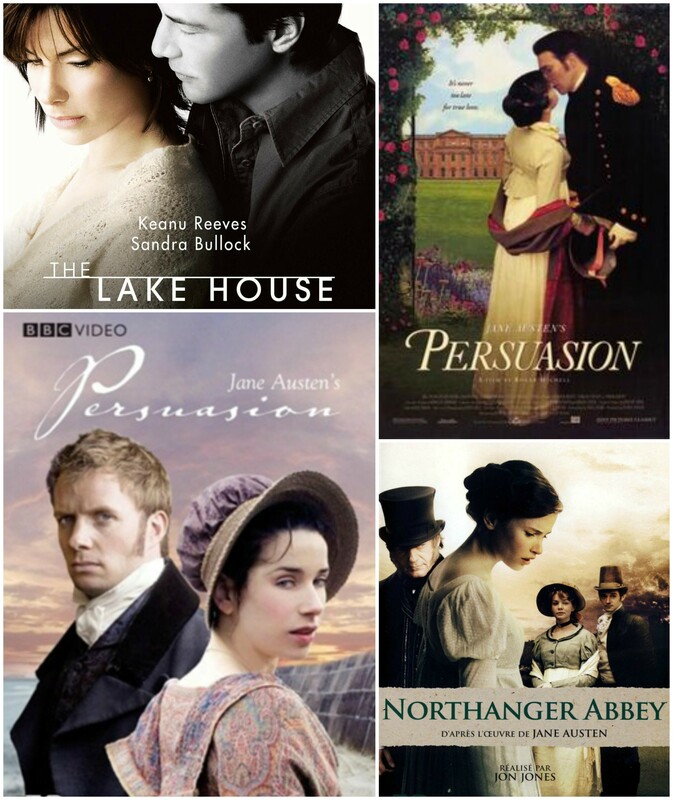 In the 1995 and 2007 adaptations of Persuasion, both by the same name, and the 2006 film The Lake House, directors appeal to modern audiences in different ways, while still retaining some of the original romance from the book. For the 1995 version, this meant stressing the heartbreaking tension between the movie’s leading characters. Due to Anne’s strong character, which prevents her from showing her emotions, most of the clues to her inner emotions are demonstrated through body language and close-ups. The feelings that Captain Wentworth’s actor, Ciarán Hinds, experiences are also hard to decipher as he almost never smiles, but this is rewarded at the end when he confesses his thoughts in his letter. The 2007 adaptation tackles this a little differently by giving us access to Anne’s thoughts through journals, paired with voiceovers. This technique brings us closer to Anne’s character by acquainting us with her inner thoughts. The movie adds a similar scene with Captain Wentworth in which he speaks with Captain Harville about Louisa, from which we learn that he has no intention to marry her and instead wishes to rekindle the romance between himself and Anne. Following the novel’s events, the audience is left suffering, waiting for the two to meet each other and confess their feelings. The long scene where Anne runs after Captain Wentworth and ends up running the entirety of Bath not only makes us want to laugh but also places us in her shoes, experiencing her desperation first-hand. A majority of the action in these movies centers around the romance of the main characters, Anne and Captain Wentworth, rather than the problems of the extended family. Mr. Elliot’s plans to elope with Anne are either dramatized to add more effect to the central romance, or are briefly mentioned so as not to draw too much attention. 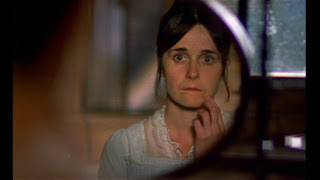 Anne Elliot observes her image in the mirror, communicating her inner pain with just a look. Persuasion. Directed by Roger Michell. Sony Pictures Classics, 1995. Film. The Lake House adds a new element to the story by changing many of the characters, the setting, the time period, and adding an element of time travel. The romance between the two characters, Kate and Alex, is unique, evolving out of a friendly banter rather than a traditional, Regency-period conversation. The biggest change to the story is the shift in focus on Captain Wentworth’s perspective, considering we do not get his side of the story in the book until the very end. Alex has a very stressful relationship with his narcissistic father, who is meant to be Sir Walter. This suffering is meant to replace most of the heartache he experiences after Anne rejects his marriage proposal, since he does not meet and fall in love with her the same way that he does in the novel. Instead, he gets to know her future self as they exchange letters, and only meets her past self as he randomly encounters her. The first time they meet, Alex is in love with her and the two end up kissing, although Kate seems to be drawn to him because of the atmosphere. The next time he sees her, he gets into an accident. When Kate figures this out, she has to quickly find a way to save him, mirroring Anne Elliot’s strong-minded personality when she saves Louisa at Lyme. However, the movie quickly counters this when Kate asks Alex to wait for her. In the book, it was Anne’s unconditional love for Captain Wentworth that brought them together, as well as her patience. In this adaptation, Alex is the one that must wait for her, thus shifting our focus from Anne’s suffering to Captain Wentworth’s. In order to balance this new plot, which focuses on the romance of Anne/Kate and Captain Wentworth/Alex, the director removes any problems of classism and greed from the original novel. Characters Kate and Alex sit on a porch, deliberate the meaning of Jane Austen's "Persuasion". The Lake House. Directed by Alejandro Agresti. Warner Bros. Pictures, 2006. Film. Despite the brutal cut of social critique from Jane Austen’s novels, directors recognize the importance of the romance that she writes. Therefore, when they decide to adapt her work to the screen, they choose to focus on the romance. By doing so, they either present an excellent romantic interpretation of her books, such as in the 2007 Northanger Abbey, or they focus on different aspects of Austen’s romance that appeals to the modern audience, as found in most Persuasion adaptations. ---. Persuasion. Edited by Patricia Meyer Spacks, 2nd ed., Norton Critical Edition, 2013. Persuasion. Directed by Adrian Shergold. Clerkenwell Films, 2007. Film.